That kind of ability is one of the reasons why women of similar VO2 max values do not run as fast as men generally. A prime example is Joan Benoit Samuelson with a VO2 max similar to Frank Shorter and Bill Rodgers. Another example would be Paula Radcliffe. The overall strength just isn't there quite as much. Generally speaking those who are predominant red aerobic fibers don't have the ability to produce as much force as those who are white fiber dominated such as sprinters. However, many milers and a number of East African distance runners have a preponderance of type 2a fiber which is a form of fiber that gets the best of both worlds. I could be wrong on the specific type though. Needless to say however it does exist and is a prime example of what you may call the powerhouse animal. Just my two cents..
OK, how do you get this "maximum leg power?" Any exercises we can do that help develop it? That is a big mystery. Sometimes hill running, sprints, jumps, weights, etc, can work. Sometimes they do not. The trick is to find the type of exercise, the exact frequency and duration that is right for the individual. A distance runner can easily overdo in this department because he never gets the usual distance running signals of fatigue when his nervous system is worn out. I'm intrigued by Hobie's weight vest.. Maybe training with it as a form of resistance? But then again why not just run faster up and down hills? I've gotten stronger (and heavier) since my peak running days, so maybe I can use that to my advantage afterall...but of course that will require some good conditioning and less body fat. Cheryl-Unfortunately, You can only improve what God has given you to work with. So much is genetically determined in my opinion. NO amount of training will ever make me run like Haile Gebriselassie unfortunately. But I feel blessed to have what I was given and will make the most of it anyway I can. Yes, you can most definitely. Just don't deny body what it needs to get to that level of body fat. I have seen a few good runners go out of whack hormonally because they starve themselves in the process. Thanks. Trust me, I'm in no danger of starving myself. I like food too much for that. Hopefully as I add miles over the course of months, I will become more lean in a healthy way. Steve - do not be too quick to say never. I would agree that no amount of currently practiced training methodologies could get you to run a sub 59:00 half. But there might be something we do not know about. You might be connecting two wires away from a sub-59:00 half. 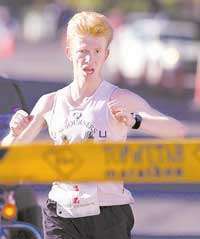 An argument for that - Sarah looked at a picture of Ryan Hall finishing 59:43 half and said - is that Steve? Runners of your build have run world-class times. The fundamental problem for this type of runner is somewhere in the internal wiring. It is a matter of knowing where those wires are and how to connect them. But we know so little about those wires. Yes, Steve, you are a lot closer to Haile than I am to Paula Radcliffe.